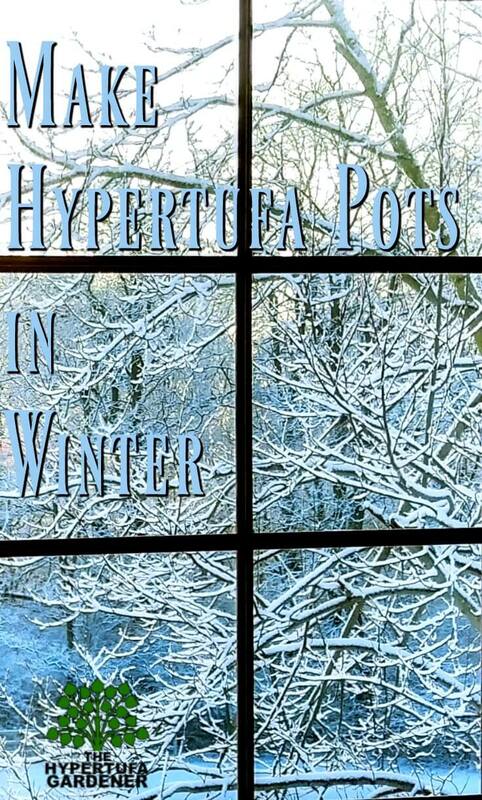 Yes, I do make hypertufa pots in winter. I like to be ready for spring and have a few all ready to set outside in early spring. Then on a warm spring day I can do my leaching process and they’ll soon be ready to plant up. Hey, it’s what I do. They can cure in the basement while we are outside sledding. I have access to a part of the garage which gives me room to make a workshop there. Yes, it is cold in there. It maybe stays a little warmer than the outside temperature. 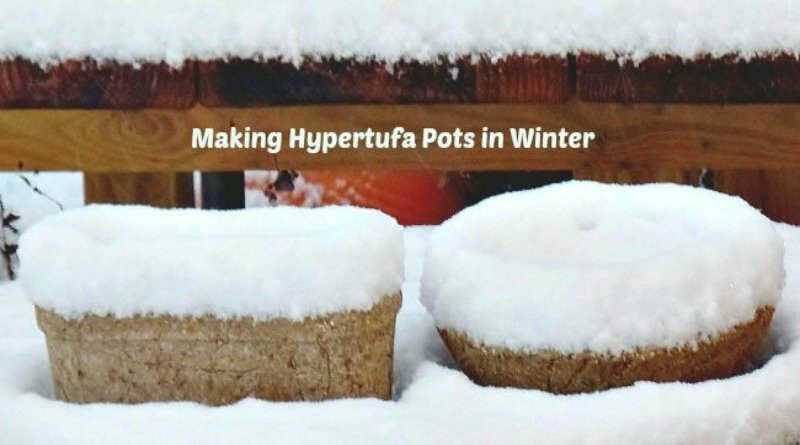 At this point, I have not tried to make the hypertufa when the temps are really cold outside, such as when it drops close to zero degrees or lower. It is too hard to keep it warm out there. And even when the wind chill gets to the lower teens, I am NOT in the mood to try cement or stone garden planters at that time. Especially the clean up! 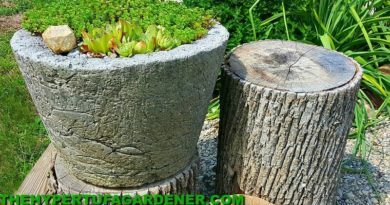 The hypertufa planter is just like one of the concrete garden containers, so treating it the same way seems logical. But my method uses my garage and the heat from a kerosene heater. If you don’t have one, you may want to get a heater of some kind because of the convenience of having heat when you want it. You may be comfortable with an electric heater like this one .Vornado MVH Whole Room Vortex Heater, Black . If you use kerosene, be sure that you have adequate ventilation and keep clear of all flammable materials. I have had a kerosene heater for many years. It is just a simple one and if I plan early enough, I can be sure to have kerosene on hand. Plus you would want to start the heater early enough so that it has time to warm up your work area. If you have the electric one, just plug it in and wait for the room to heat up. My husband likes to go out into the garage to do his projects and occasionally some work on the truck. So we are used to firing up the heater every now and then. 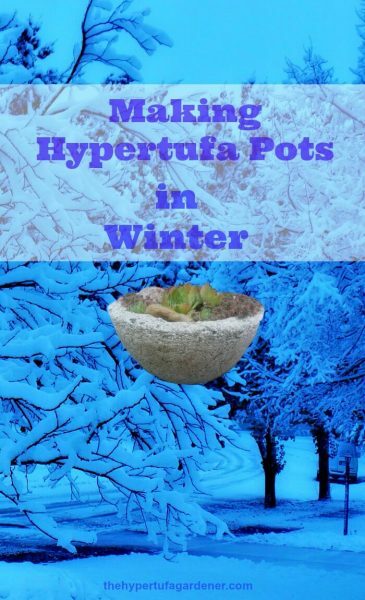 Here is an old video of me making hypertufa pots during a cold period when I made a few containers. I was working in the garage, but now have a new workshop in the basement at the new home. It is even more convenient and I have more room to store the new pieces til spring. Do I do anything different with the Hypertufa Pots? I do the process the same as in the summer, though I may have the water in my pitchers just slightly warm. Otherwise all the same processes apply. Now the clean up is the real kicker: Just have a hose that you can attach to the spigot, clean up your mixing bin and tools and you are good. Just remember to detach that hose , drain, and bring back inside! Don’t let it freeze! When my piece is finished, I wrap it as usual into a large garbage bag. Then I carry the piece down into my basement. I don’t try to cure the piece in the garage because I think it will get too cold. I only heat the garage long enough to make the piece and then put away all the supplies etc. But curing goes on in the basement. You really just need to place the wrapped piece down there and keep it fully wrapped for 3-4 days. I use the longer time when I am curing inside at probably 65-70º room temperature because I think it takes longer than in the summer when my garage temps go so much higher, or the outside temps are sometimes from 80-90º or more. Technique in the winter changes my original cure time from 1-2 days to the 3-4 days. After the cure time, I carry it back out to the garage for a quick removal from its form, texture it , and then re-wrap it and back to the basement it goes. So I will make mine all season long inside. Those that I made in past years are just fine. 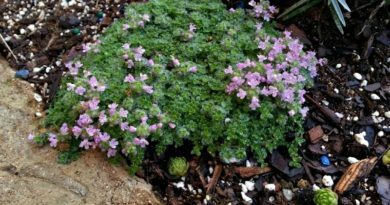 Try it for one hypertufa pot this year if you have some doubts, and then maybe by next year you will be ready to go! Are you making any this winter? 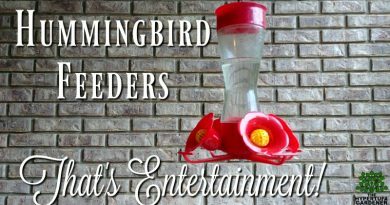 Hummingbird Feeders – So Entertaining!